Despite a low overcast ceiling, the Bluebonnet Air Show in Burnet, TX was a resounding success. Jon took CJ-6A bord LN out to the show and was joined in formation by Mile's CJ, 7NF. The show featured a demonstration by the USAF West Coast A-10 team, parachute jumpers, and a large number of WWII warbirds. 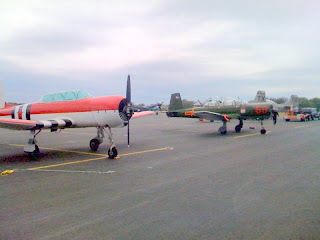 A P-40 can be seen in the background between the two Changs. 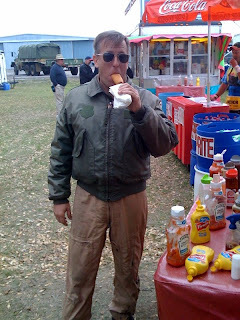 Of course, one of the biggest reasons to go to air shows is for the junk food. Bluebonnet did not disappoint. Here, Jon is seen participating in that age-old tradition.